← Is That Falafel In Your Pocket, or Are You Just Hungry? Hello to everyone out there to another chapter of Mastication Monologues! Today’s entry is a bit off of the well chewed culinary path I have blazed throughout my life, but it was one of the hidden jewels that I promised myself I would try one day: Ethiopian food. Now many people would be apprehensive about trying food from Africa mainly due to simply not knowing what exactly grows or is raised in the different countries of the continent. However, Africa has a plethora of cultures that today are blends of many different ethnic groups that have been rearranged due to tribal wars, European colonialism, and modern day globalization. The types of food could range anywhere from the more Middle Eastern style cooking of North Africa like the Moroccan tagine to the western coast of the continent which had a significant impact on American southern cooking with such ingredients like peanuts, okra, and black-eyed peas. However, I explored the northeastern corner of the continent at Ethiopian Diamond Restaurant and Bar located at 6120 N Broadway St Chicago, IL 60660. The reason why I’ve always been fascinated by trying Ethiopian food is much more than pure curiosity and word of mouth, but rather Ethiopia is an interesting country by itself. First off, the continent of Africa during the age of exploration was more or less carved up by European nations all vying for global supremacy, but Ethiopia had other ideas. Like its Asian counterpart Thailand, it was the only country in Africa never to be conquered by an invader in its history including defeating the Italian army on multiple occasions (not a very hard task, if you ask me). Nevertheless, Ethiopia’s history stretches back to the beginning of mankind including being home to supposedly the Arc of the Covenant, and the famous emperor Haile Selassie who was a symbol of African unity and considered by Rastifarians as “Jah” or the incarnation of God. History lesson aside, time to talk about the food. I knew that Ethiopian food was somewhat like Indian cuisine due to their long history of trade with Arab and Indian spice merchants, and their penchant for eating with their hands is another residual effect which is commonplace at Diamond. However, they will give you silverware if you’re a germaphobe or just don’t feel like getting really messy with your food. When we walked into the restaurant, I was greeted by a very elegantly decorated place with a pleasant atmosphere. The service overall was less than ideal since it took them forever to actually give us menus/take our order, but the food more than made up for it even though the vegetarian portions were undersized for the price. I ended up ordering the traditional Ethiopian dish Doro Watt (chicken in spicy sauce) and Kik Alicha (stewed yellow lentils with garlic and onions) along with an Ethiopian beer called Bedele, and my friend ended up getting the Veggie Combo which ended up with her choosing Yemisir Watt (red lentils in spicy sauce), Dinich Alicha (potatoes and carrots in a mild onion and garlic sauce), and Quosta (simmered spinach with onions and garlic). When the food and my beer came out, I was very surprised at the presentation. 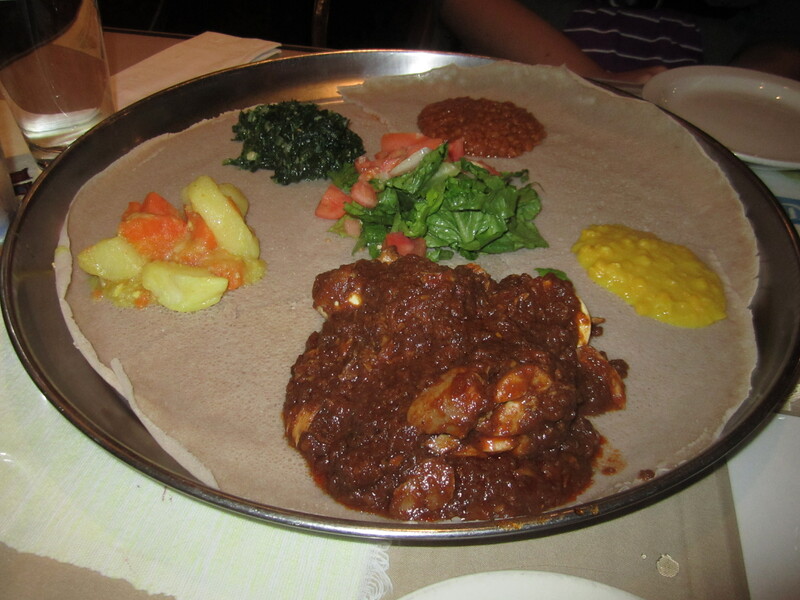 It was like everything was served on a large deep dish pizza platter that was layered with the traditional Injera bread which had the texture similar to a kind of spongy pancake and is to be ripped apart to be used like a utensil to pick up the food. Then on top of all of the bread were our choices in individual mounds like mini-mountains rising above the sandy colored savannah while circling the verdant tomato, lettuce, and onion salad spoke to this wheel of deliciousness. My Doro Watt consisted of chicken legs marinated in lemon juice and ginger while playing Marco Polo with pieces of a hard-boiled egg in a spicy sauce. The legs were very substantial, and the meat was so tender it was falling off the bone. I could taste a little bit of the lemon through the sauce that was the best part of the dish. I could only liken it to a spicy Indian curry which helped me stomach the hard boiled eggs which I’m not a big fan of in general. However, the Injera bread allowed me to make small spicy chicken tacos with the lettuce and tomatoes in the center which was great since it was much more durable than any tortilla I’ve ever eaten. Unfortunately, my dining companion did not want to partake in the traditional Ethiopian practice of gurrsha or the forming of bonds of friendship by placing food nestled in Injera brad in the other person’s mouth (proceed very carefully with this one, diners). The Kik Alicha was pretty much split peas, a.k.a. lentils, cooked in a mild sauce of onion, garlic and ginger. I was indifferent to the actual lentils, but the sauce had a very mellow flavor with each ingredient in perfect harmony. I also tried some of my friend’s Yemisir Watt which was red lentils cooked with onions in a spicy sauce. The sauce was quite flavorful and had similar curry undertones like in my Doro Watt, and the Dinich Alicha was quite delicious since the potatoes were buttery soft. As for the Quosta, it was quite fresh, and thankfully the consistency of it wasn’t too creamy. Instead, it was like eating a warm salad with a light garlic vinegarette. 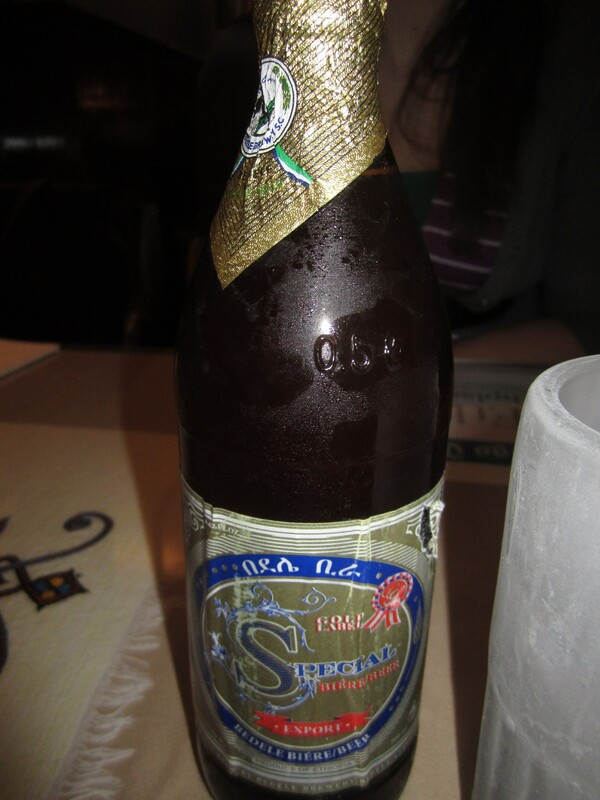 As for my beer, I read online that one should absolutely get the Bedele beer since it’s a traditional Ethiopian brew, and it did not disappoint. It had a golden brown hue to it with subtle honey notes and clean finish. It was quite light and complimented the bolder flavors contained in my food. It seemed similar to a honey wheat type of brew, so I was genuinely surprised that such a delicious beer could come out of such a non-traditional beer country like Ethiopia. So if you’re looking for someplace to taste an authentic slice of Ethiopian culture by getting your hands dirty, come on down to Diamond Ethiopian Restaurant. 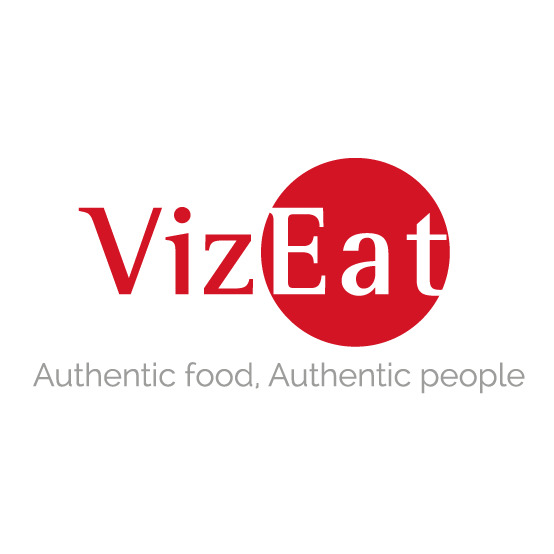 Posted in African Cuisine, Ethiopian and tagged authentic, Bar, Beer, Beverages, bread, Chicago, chicken, dining, Ethiopian, Food, grill, Illinois, lentils, potatoes, restaurant, Reviews, sauce, spicy. Bookmark the permalink.